. :: GODOLPHIN’S THUNDER SNOW WILL RUN IN THE KENTUCKY DERBY ::. Leading three-year-old colt Thunder Snow will run in the G1 Kentucky Derby, America’s most famous race, at Churchill Downs, USA, on Saturday, May 6. 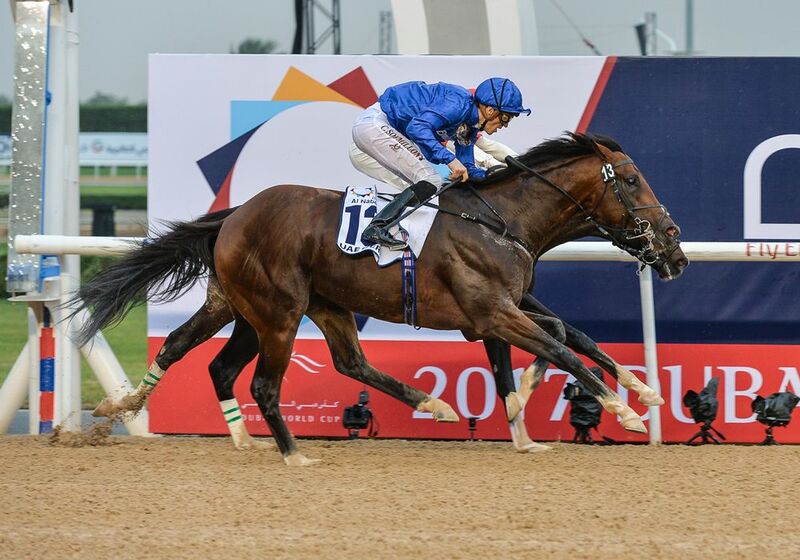 The son of Helmet, trained by Saeed bin Suroor, will remain on dirt following two victories on the surface at Meydan, UAE, earlier this year including a last-gasp success in the G2 UAE Derby over an extended nine furlongs on Dubai World Cup Night, March 25. He also stormed to an easy win in the mile G3 UAE 2000 Guineas on February 11. Thunder Snow was the top two-year-old colt trained in Britain last year and ended a progressive turf campaign then with a dominant five-length victory in the G1 Criterium International at Saint-Cloud, France, in October. The US$2-million Kentucky Derby, run over 10 furlongs, is the longest continually held sporting event in North America and the first race of the US Triple Crown, which is completed by the G1 Preakness Stakes (May 20) and the G1 Belmont Stakes (June 10). Born and raised in Dubai, Saeed bin Suroor is Godolphin’s longest-serving trainer, overseeing the training of horses since 1995. Saeed is one of Britain’s leading trainers collecting the first of four British trainers’ championships in his second year in charge, before following up in 1998, 1999 and 2004. He has sent out 12 British Classic winners since 1995 headlined by Lammtarra and has saddled seven Dubai World Cup winners including the brilliant Dubai Millennium who won for Saeed and Godolphin in 2000. His other notable international wins include Sulamani’s victory in the Arlington Million in 2003, Daylami (1999) and Fantastic Light (2001) in the Breeders’ Cup Turf, while France’s top race, the Prix de l’Arc de Triomphe, was won by Sakhee (2001) and Marienbard (2002), as well as Lammtarra (1995). In October 2008, Saeed broke new ground with Godolphin’s first Group One winner in Australia when All The Good won the Caulfield Cup. The trainer enjoyed another fabulous Dubai World Cup Carnival in 2015, highlighted by Prince Bishop winning the world’s richest race, the Dubai World Cup. He has collected the Leading Trainers' title at the Dubai World Cup Carnival on eight occasions (2008, 2009, 2010, 2011, 2012, 2013, 2014 and 2017). Saeed bin Suroor has had over 2,000 race wins globally including 179 Group One victories. Saeed trains from his home base of Al Quoz Stables in Dubai from November to April, and is based at Godolphin Stables in Newmarket, England, during the rest of the year.